Don't forget to make sure you can move comfortably on the dance floor. When prom rolls around, the hype and gossip tend to fall on what the ladies plan to wear on the big night. Of course, girls only make up half of the prom population, and guys can't rightly show up sporting jeans and a T-shirt. To make your prom a night to remember for you and her, follow a few ground rules for fashion. Remember, though, style is personal and fashion rules are made to be broken, so feel free to inject your own personality into your duds. If you have doubts about how to dress for prom, you simply can't go wrong with the classics. A black tux, complete with lapels and a bow tie, is a fail-proof choice for prom night. Likewise, gray and navy suits practically never go out of style, and they're good investments for a man to have in his closet. Never neglect proper fit; try your tux on before prom night and have a store associate or tailor help you select and fit your wardrobe. If possible, buy your tux instead of renting it to ensure it's personally tailored to you. This option may also be cheaper in the long run as suit rental can be pricey. Don't gloss over the details. Always match your accessories to your suit. If you have a black tux, your shoes, belt, socks, suspenders, ties and the like should all be black. Finishing touches such as a subtle pair of cufflinks or a sleek tie bar can really complete your prom attire, and they show your date that you put effort into your appearance. As you accessorize, think of your outfit as a whole rather than as single pieces that look good by themselves. For instance, if you wear fitted or slim pants, choose a smaller bow tie or skinny necktie to match. Look to the world around you for style inspiration. If you like trends, pay attention to what male celebrities you admire wear on the red carpet. That's likely the type of outfit you want to create. Be a gentleman and consult with your date before your finalize your outfit. Even if you don't match your date exactly, think about how your outfits will complement each other in both color and style. For instance, matching your tie, shirt or vest to your date's dress definitely earns you prom night style points. While it helps to take inspiration from tested styles, clothes are an extension of your own personality. If you want to inject a little edge into your prom style, try going sans tie or mixing the colors of your suit. For instance, try charcoal-gray pants with a black jacket, or a navy jacket with black pants. If you're a guy who loves color, use your shirt or tie as an opportunity to add a little color to the occasion. Likewise, the addition of a vest can add character to your ensemble. Two-toned or textured ties also let you have some fun with your suit. Seventeen: Make Your Guy Look Hot for Prom! Ketchum, Dan. 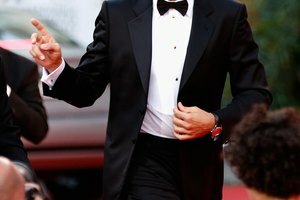 "How to Dress for Prom for Men." Synonym, https://classroom.synonym.com/dress-prom-men-7793.html. Accessed 18 April 2019.